With an extensive range of solutions, we aim to enhance individual architectural vision by creating innovative and creative architectural spaces. Elval Colour’s main products are etalbond® aluminium composite panels, Orofe® pre-painted aluminium coils and sheets for roofing applications, Ydoral® pre-painted aluminium for rain gutters, ENF® corrugated sheets for roofing and façade applications. Our products are offered in a wide range of standard and customised colours, which are made in our own colour-mixing lab and applied in one of the four coating lines to match any customer or project requirement. Elval Colour contributes with etalbond® and special coatings in order to create energy-efficient and sustainable buildings for both architects and designers. Environmental Product Declarations are available for all of our products. We ensure that we deliver sustainable material and leadership in green building material and innovation by understanding market needs, as well as committing to technological prowess and continuous improvement of processes and products. Elval Colour focuses on being a reliable partner that offers value-added services to customers by assisting in product specification and selection to best suit the needs of the project or application. Customer orientation and dedication accompanies production and product delivery. Our team enjoys what they do and aim to achieve their corporate objectives with energy and enthusiasm. Elval Colour has two manufacturing sites in Greece, which incorporates state-of-the-art equipment and employs 200 people. Established in 1977, we are a subsidiary of the ElvalHalcor, the aluminium and coper processing and trading unit of VIOHALCO. More than the 95% of our sales are exported to 70 countries worldwide. We are a member of the European Coil Coating Association (ECCA) and the European Aluminium Association, as well as certified by BBA, DIBT, CSTB, UAE Civil Defence and many others. We also have ISO 9001-2008, ISO 14001-2004 and OHSAS 18001 accreditations. Elval Colour is participating at forthcoming the Zak World of Façades United Kingdom. Elval Colour is a leading European coil coating supplier with a production of more than 35 million square metres per year. With over 30 years of experience in coating and colour matching, Elval Colour is an excellent partner for your projects. etalbond® is a technologically advanced product whose unique features facilitate creative architectural design. Elval Colour pre-painted aluminium coils and sheets for roofing applications meet the most demanding construction and design requirements without making any compromise in quality. The Grand Egyptian Museum is a planned artefacts museum to be located in Cairo, Egypt. Dedicated to Egyptology, it will be the world's biggest archaeological museum and is expected to attract eight million tourists by 2020. Goldin Finance 117 is an iconic, 597m-high building being built in Tanjin, China, as part of the Goldin Metropolitan project being developed by Goldin Properties Holdings. Following the successful ‘Future Trends in Building Envelopes’ conference , Elval Colour organises a seminar titled 'Present and Future in the Design of Facades of High-Occupancy Buildings'. On 13 September 2017, Elval Colour was awarded the Green Certificates of etalbond®FR and etalbond®A2, by the Singapore Green Building Council SGBC. Coated aluminium composite panels etalbond® in grey and white tones of colours, arches with true anodised and perforations with interior lighting. These were the elements that the visitors were excited about at Elval Color booth in BATIMAT exhibition in Paris. Elval Colour's Natural Anodised Gold and Bronze give a cozy feeling to the Campus Zuid Courtyard of Karel de Grote University. Elval Colour has announced that it will launch a new generation of advanced composite panels in 2016, consisting of two aluminium cover sheets and a mineral-filled core. Transforming the 'ugly-duckling' into a beautiful swan: In other words, making the old water towers in Handen to be a landmark. For this very challenging project, Elval Colour supplied 5,000m² of etalbond® composite panels. Elval Colour has developed a remarkable anti-graffiti coating for its etalbond® composite panels, and ELVAL ENF™ solid façade sheets. Elval Colour was selected by the architectural team of the new airport in the city of Zhengzhou, China for the supply of more than 1,100MT of coated rolled aluminium, used to shape the 400,000m² aluminium roof of the new airport. 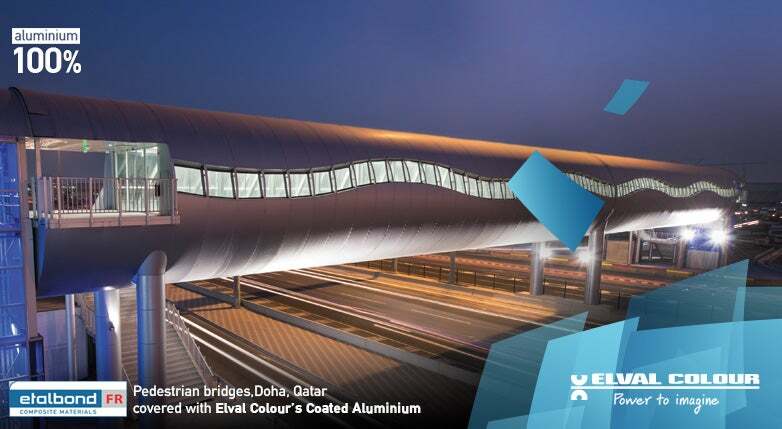 Elval Colour has supplied coated aluminium composite panels for new bridge projects in Doha, Qatar. Elval Colour offers a complete range of products in coated aluminium to meet all building envelope requirements.